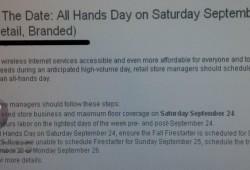 Details are sketchy at best but we’ve just received a huge number of emails indicating that T-Mobile has called an “All Hands Day” meeting for September 24th for unknown reasons. Could this be a pre-iPhone launch meeting? Could this be related to the AT&T takeover or could this be related to T-Mobile discovering water on Mars? In any case, mark your calendars down for September 24th because something is going down.